Place chipotle peppers and diced tomatoes in a blender with 1/2 cup of water. Purée until smooth. Heat olive oil in a large nonstick pan over medium-high, sauté minced onion, garlic cloves, cumin, salt and pepper until soft and translucent, about 4 minutes. Add tomato mixture and bring to a boil. Add shredded chicken and heat through. 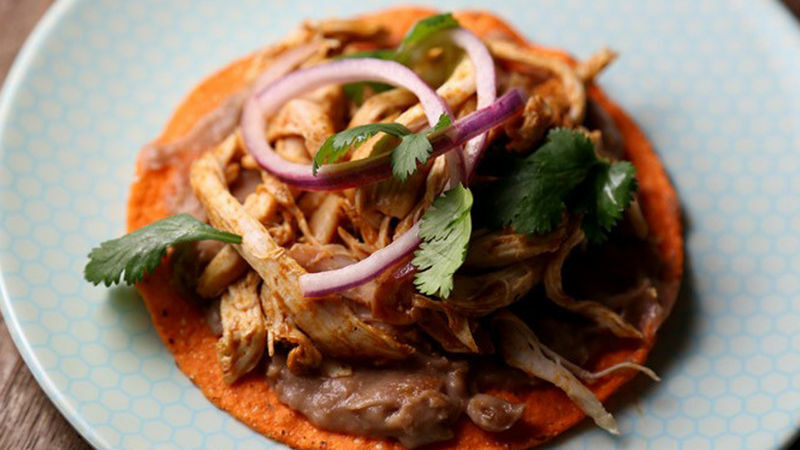 Spread refried beans over each tostada, top with spicy shredded chicken and garnish with pickled onion and cilantro. Serve and enjoy! Purchase a rotisserie chicken from your grocery store to save time. Spice up your Cinco de Mayo with spicy chicken tostadas! Perfect for a crowd, this spicy chicken is a great option for your guests to customize their own tostada.